We are pleased to announce that Zero Books and Pluto Press are both offering discounts in association with The Body Productive. 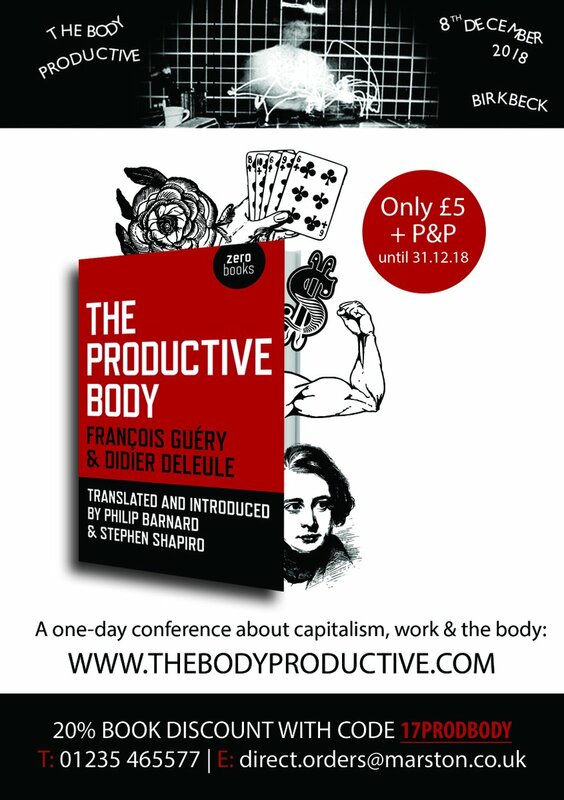 François Guéry and Didier Deleule’s The Productive Body (1972), translated and introduced by Philip Barnard and Stephen Shapiro (2014), is available from Zero Books for £5 + postage & packaging, a 20% discount. To make use of the discount order directly from Orca Book Services Ltd by emailing direct.orders@marston.co.uk or calling 01235 465577 quoting the discount code 17PRODBODY. It will also be possible to buy or order at the conference. In addition, Pluto Press are offering 20% off Stephen Shapiro’s How to Read Marx’s Capital (2011) and Shapiro & Anne Schwan’s How to Read Foucault’s Discipline and Punish (2011). To claim the discount, order from plutobooks.com, quoting the code SHAPIRO at the checkout.